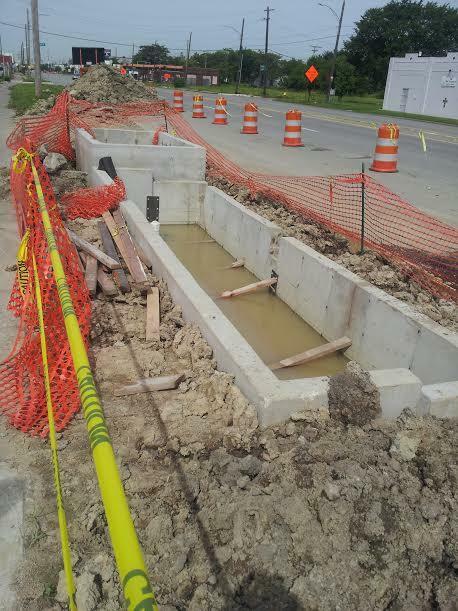 This is Detroit's first bioswale, a piece of green infrastructure in the making. The traditional fixes are expensive. But a couple experiments are underway that could help ease the problem. A stretch of Mack Avenue on Detroit’s east side is a good little snapshot of the landscape you find in many parts of the city. Mack is a busy thoroughfare, lined with small churches and storefronts — some occupied, some abandoned. But turn onto a side street, and it suddenly takes on a rural feel — a nearly empty paved road extends through lush greenery, dotted with just a few houses. That’s what it’s like here, near the corner of Mack and Lakeview Street. Right at this corner is a well-tended lot ringed by a wood fence. Running alongside the curb is a construction project ringed by yellow tape. The bioswale takes some strain off the conventional combined sewer system, she adds. Around half an inch to one inch of rainfall will go back into the ground instead of into the sewer system. This bioswale is the first in Detroit. But it’s just one of a number of so-called “green infrastructure” projects scattered around this part of the city. This is Lakeview Street in Detroit, an instance of how a green and rural feel infiltrates city landscape. In some cases these green infrastructure projects look something like the “gray” or traditional water infrastructure we’re used to. But green infrastructure can also look like the lot right next to the bioswale. It’s growing pennycress, a biodiesel feedstock. Replacing any hard, non-absorbent surface with something more permeable in this way can in itself be green infrastructure. In some cases, it’s just a matter of landscaping. “And in fact, that’s what makes these things so sublime, is that this allows us in Detroit to transform one of our largest liabilities into a huge asset,” says Dan Kinkead, acting director of the Detroit Future City Implementation Office. Detroit Future City is a plan that outlines a detailed, long-term vision for the city’s landscape. A big part of it outlines strategies to handle Detroit’s roughly 24 square miles of vacant land. And a part of that vision means piloting green infrastructure projects. 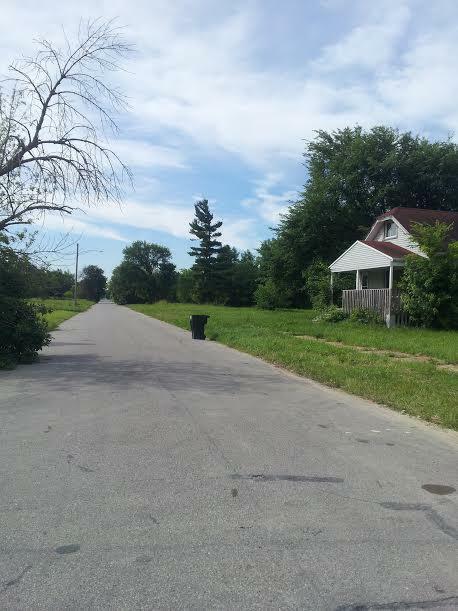 It includes small projects on scattered vacant lots, like the one at Mack and Lakeview. It also includes a larger, more concentrated project on a commercial urban agriculture site. Kinkead says the big idea is to manage storm water better than “gray” infrastructure alone can. Kinkead admits that for now the projects are small. And on their own, they won’t make much of a dent in the current system. But they will provide important data — and possibly the seeds of a new approach to water infrastructure.